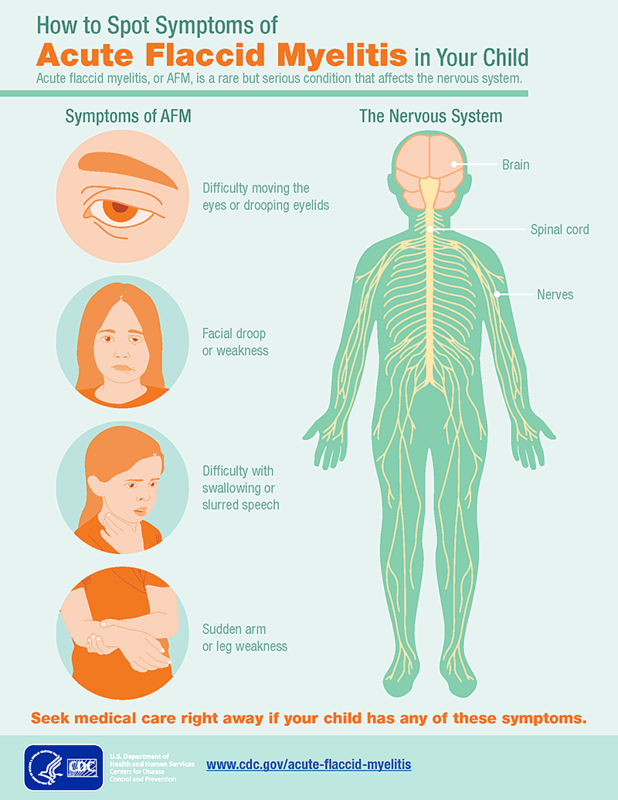 An infographic from the CDC on how to spot Acute Flaccid Myelitis in children. A rare and mysterious affliction appears to be on a national upswing, and North Carolina has two possible and one confirmed case of Acute Flaccid Myelitis so far this year. The Centers for Disease Control says AFM impacts the spinal cord, causing weakness in limbs and sometimes paralysis. The cause of these symptoms are unknown, according to State Epidemiologist Zack Moore. “I think most people suspect it's not caused by one single thing, although, you know, it could be that there are, for example, certain types of enteroviral infections that can lead to this syndrome and may be causing a good number of the cases,” Moore said. Moore insists that while some symptoms appear to be like polio, AFM is not linked to polio. He says it's not clear why most AFM cases are reported in children. To be safe, however, Moore urges parents to get their kids vaccinated and encourage frequent hand-washing. Symptoms beyond the common cold should be reported to a physician. Dr. Sallie Permar of Duke Health says it's unclear why the syndrome is reported more often in children than in adults. Permar echoes the state Health Department and the CDC in stressing that AFM is extremely rare.